[deater] readily admits they’re a little behind on what’s new in gaming – only having just gotten around to Valve’s 2007 release of Portal. It’s a popular game, but [deater] didn’t want anyone to miss out on the fun – so set about porting Portal to the Apple II. The port uses the “hires” mode of the Apple II for the flashy graphics that were state of the art around 1980 or so. It’s not a copy of the full game – only the first and last levels, combined with Jonathan Coulton’s now-classic ending theme, Still Alive. As is to be expected, it’s not a wild, fast paced gaming experience, but a cool use of BASIC to put together a fun tribute to a popular franchise. It’s a little different to the original – portals can be placed anywhere, for example – but it rings true to the original. Source code and a disk image is provided, so you can try it for yourself – even in this online emulator. We’re looking forward to the sequel so we can use the post title “Portal 2 Ported To The Apple II, Too”, but until then, check out [deater]’s Apple II web server, also in Applesoft BASIC. Video after the break. [Michael Gainer] is a big fan of Portal, and it shows in the Weighted Companion Cube he made. [Michael] hand-machined the many pieces that comprise the Cube’s body and medallions out of 6061 aluminum. Dykem was used to transfer the marks for accurate machining, and the color is powder-coated to a heat tolerance of 400F. A CNC was used to make the distinctive hearts. [Michael] notes the irony was “very Portal” in having them cut by a heartless machine when everything else was done manually. The attention to detail is striking, the level of design more so when [Michael] proceeds to incinerate the poor Companion Cube with a brush burner. In the video shown at the link above, the Cube falls apart as the glue holding it together melts. When all is said and done, just grab more glue to bring that Cube back to its six-sided glory. Repeat to your heart’s content. Huge success! We have to be honest, after seeing all those pieces, we aren’t sure we’d want to do this very often. Companion Cubes have been featured in various iterations on Hackaday before, but they were never built with the idea of repeatedly destroying and rebuilding them. This novel take would make GlaDOS proud. [Michael] has plans to put an Android device inside it with some light and temperature sensors. He wants to give it a voice resembling Portal’s turrets so it can whine when it needs to be charged or scream when it’s too hot or cold. He dubs this next project the “Overly Attached Weighted Companion Cube.” It wouldn’t be a good idea to incinerate this upcoming version, though we’d probably be inclined to if it demanded so much of our attention! Ah yes, Portal — one of the most iconic puzzle games from this past decade by Valve. [Yvo] just put the finishing touches on his fully 3D printed, working, Portal Turret. Well — it doesn’t have guns — but it does just about everything else! This intricate prop replica has attention to detail written all over it. [Yvo’s] carefully designed it to actuate as close to the video game model as possible. Its eye and arms move, has a targeting laser and even features a camera for color based object tracking. You can also play around with it using a joystick — but it’s much more fun to leave on autonomous mode. Because the whole thing is 3D printed, [Yvo] has also made up an Instructable for making your own, and according to him, it’s not that hard to build! This isn’t his first rodeo either, if you remember the awesome GlaDOS we shared last year — that’s his too. While most of the entries to our Sci-Fi contest come from movies and TV shows, a select few are based on the Valve universe, including a few builds based on Portal and Team Fortress 2.
Who wouldn’t want a gigantic articulated sociopathic robot hanging around? 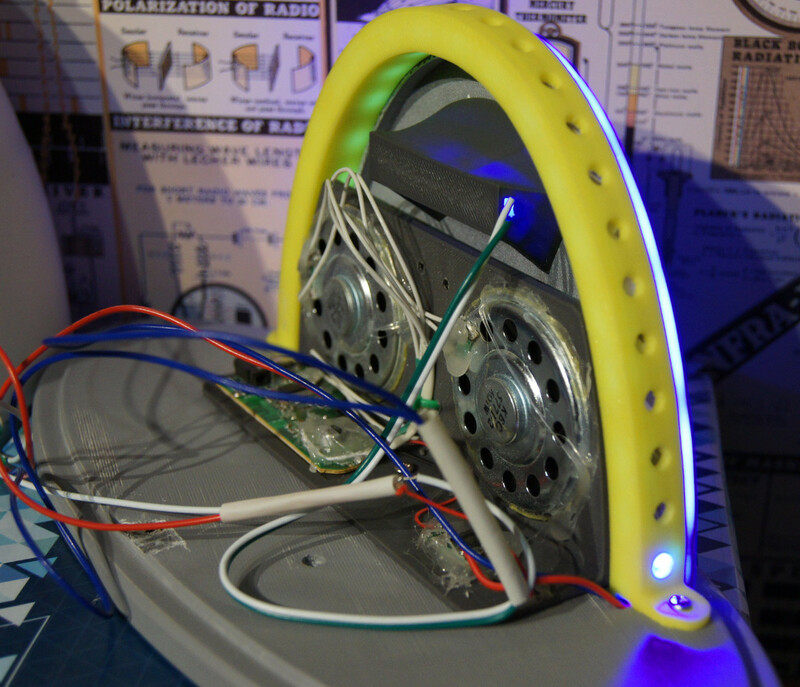 Two groups are building a clone of GLaDOs from the Portal series. and already the builds look really great. [AmarOk], developed an open-source personal assistant called RORI that intends to be a more helpful version of GLaDOs, without all the testing and killing. He, along with [Peterb0y] and [n0m1s] are turning this personal assistant software into a GLaDOs replica. Taking a slightly different tack, [Eric] and [jjyacovelli] built a GLaDOs-like robot with a camera in the ‘face’. This camera connects to a Google Glass and tracks the user’s head movements. There’s also a Nerf gun attached to the end of the robot body, triggered by double winking. Yep, it’s a heads-up display GLaDOs, perfect for punishing your test subjects. Not to be out done by a malevolent, hyper-intelligent artificial intelligence, [Tyler] and [Ryan] are building the cutest gat’ dern weapon in all of west Texas. It’s the level one sentry from Team Fortress 2, and the guys are turning one into a paintball sentry. 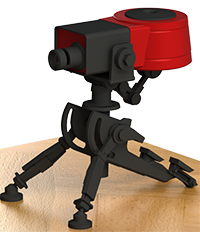 The TF2 sentry is a cute little bugger capable of motion tracking and perimeter defense, filling enemies with lead should they ever come too close. While the end result probably won’t be as large or as heavy as the “official” real-life turret, a smaller table-top sized model is probably a little more practical. Even if it doesn’t live up to expectations, upgrading the sentry is simply a matter of whacking it with a wrench a few times. There’s still time for you to cobble together an awesome Sci-Fi project and have a chance to win some awesome prizes.